When it comes to cleaning our homes, we can easily get lost in the many different cleaning products to choose from, not to mention the scary sounding chemical ingredients these products usually contain. Denatured alcohol, also known as methylated spirits, is a greener alternative for your everyday cleaning needs and other domestic jobs. Many of us are not aware of the many uses of denatured alcohol and how versatile this product really can be. 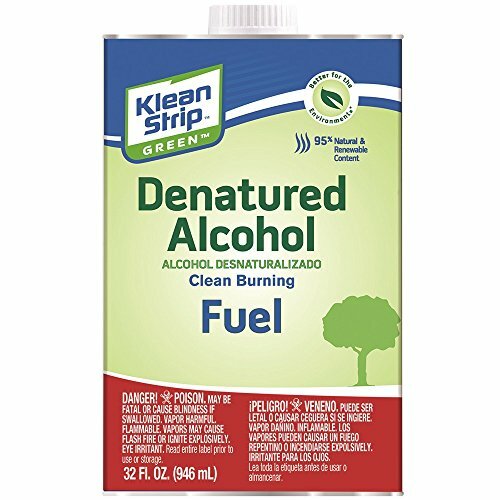 So what is denatured alcohol exactly and in what ways can we use this household chemical responsibly in and around the house? Let’s have a closer look at some of the most efficient denatured alcohol uses. What Is Denatured Alcohol, aka Methylated Spirits? Methylated spirits is ethanol (alcohol) that has been made unsuitable for drinking by adding additives such as methanol. Not only does this make methylated spirits toxic, but it also gives it a bad taste and a bad smell. The purpose of this is to prevent people from drinking it as a cheap alternative to alcoholic beverages. Denatured alcohol is also often colored brightly (mostly purple or blue) to make it stand out from the crowd and to not confuse it with other cleaning products or alcoholic beverages. While methylated spirits is considered toxic, it is still a whole lot more environment friendly than most other cleaning products you will find in the supermarket shelves. These cleaning products are loaded with nasty chemicals, are heavily toxic and often do more harm than good to us. And not just to us, but also to the environment. The cleaning we do in and around the house simply doesn’t require these chemical cocktails. Most manufacturers seem to believe that the more toxic they make their cleaning products, the better the cleaning results will be. While this may be true to some extent, we are often not aware of the damage they can cause to our health and to our environment. In recent years there has been a rise in eco-friendlier cleaning products, such as vinegar, eucalyptus oil and baking soda. Another one of these greener products is denatured alcohol. Denatured alcohol is poisonous and is unfit for human consumption. Never drink denatured alcohol and avoid contact with eyes or skin. Denatured alcohol is an eco-friendlier product for domestic cleaning purposes than most other mainstream cleaning products that you can find in the supermarket. For more information on the safe use of denatured alcohol, please follow the instructions on the packaging. Why Is Denatured Alcohol More Eco-Friendly? So why is methylated spirits considered to be better for the environment? Denatured alcohol usually consists of mainly ethanol and methanol. Ethanol (ethyl alcohol) is mainly derived from grains and vegetables, and methanol (methyl alcohol) used to be produced as a byproduct of wood stock, although nowadays it is often derived from methane in natural gas. This makes denatured alcohol a more sustainable alternative to other cleaning products that are overloaded with chemicals. Rubbing alcohol is a type of denatured alcohol but usually contains less ethanol (about 70%) and more additives. Isopropyl rubbing alcohol is rubbing alcohol but with isopropyl alcohol instead of ethyl alcohol. Rubbing alcohol is highly toxic and is unfit for human consumption. Especially isopropyl rubbing alcohol because this type of alcohol is a much different chemical than the ethyl alcohol used in alcoholic beverages. Denatured alcohol is the perfect glass cleaner. What’s even better is that it won’t leave streaks behind, as denatured alcohol evaporates very quickly. Make sure you dilute the denatured alcohol with water (around 50%) before using it to clean your windows. Also, it’s best to use a sprayer and use a paper towel to wipe the surface clean. Denatured alcohol also works great to remove greasy and oily substances from your windows, or any other type of hard surfaces, such as tiles, wood and hard plastic. Mildew and mold are never welcome in your house. It thrives in humid areas where there is not enough ventilation. Once it’s there, it’s very difficult to get rid of it permanently. Mold can be very harmful to our health so it’s important to avoid or remove it. Use a sprayer to spray the patches of mold with denatured alcohol. Let it soak in for a few minutes and then wipe it off with a clean, damped rag. Make sure you properly dry the area after wiping it clean. Dilute denatured alcohol with warm water (50%) and you can pretty much clean and sanitize your whole house, especially bathrooms, kitchens, sinks and toilets. Professional carpenters often mix shellac with denatured alcohol to effectively protect the wood from scratches and to give it a good finish. Denatured alcohol also works well with sanding wood. Use denatured alcohol on an old cloth to wipe away any excess sawdust that may still be present after sanding. The result is a smoother surface. One very common use of denatured alcohol is as a very efficient fuel for oil heaters such as camping stoves. Denatured alcohol burns very cleanly, more so than other fuels. Please keep in mind though that the flame hardly has any color and can easily be overlooked. In other words, don’t burn yourself! Denatured alcohol is an excellent solvent and thinner. It can be used to remove unwanted paint (stains) from wood, and it can also be used to clean paint brushes. Soak your used paint brushes in a denatured alcohol solution overnight and rinse them off the next morning. Do you have an unwanted sticker on your car windscreen? Use denatured alcohol to easily remove the sticker and any remaining residue. It also works with glue, and even super glue, as denatured alcohol is a powerful dissolver. Denatured alcohol can also do a very good job at getting rid of those permanent marks on PVC plastics or whiteboards. You would be surprised how easy it is to wipe them off with the alcohol. It can also be used to remove tough ink stains from clothes or upholstery in the house. To be on the safe side, use a bit of denatured alcohol on a hidden area to make sure it won’t get ruined. Use a clean rag and only a small amount of the solution. In the same fashion, you can also remove red wine stains from clothes. It’s recommended to soak the affected area on your shirt or dress in a denatured alcohol solution. If the stain is not yet fully gone, use vinegar to try and remove the rest. Hopefully this summary of denatured alcohol uses has given you some helpful ideas on how to apply this product in your own household. Denatured alcohol comes in different varieties with different additives, but ethanol mixed with methanol as the additive is the most common form. This form of denatured alcohol can be used for the situations outlined in this article. Make sure you dilute the alcohol with water, depending on what you’re going to do with it. It can’t be stressed enough that methylated spirits is not suitable for drinking. Methylated spirits should only be used as a more eco-friendly household product instead of other, heavily toxic (cleaning) products available in the supermarkets. Using denatured alcohol instead of more toxic products is just one simple way to help make a change when it comes to living a greener and more sustainable way of life.